A meandering jet stream, not an ice age! LOS ANGELES (AP) — The Los Angeles city attorney is suing Bank of America for mortgage discrimination it claims led to a wave of foreclosures that cost the city a fortune in extra expenses and lost taxes. The suit, filed Friday in federal court, claims B of A redlined minority neighborhoods for years, then turned around and gave blacks and Hispanics predatory home loans that they couldn’t afford. The suit claims those borrowers were forced into foreclosure when the housing bubble burst and they were denied refinancing. A giant planet that has been found orbiting its star at 650 times the average Earth-Sun distance has stirred immense confusion in the minds of US astronomers, making them question planet formation theories. The planet – currently known as HD 106906 b – weighs in at 11 times the mass of Jupiter and is orbiting its star at a massive distance of 60 billion miles – a much further distance than any planet has ever previously been seen orbiting its star. 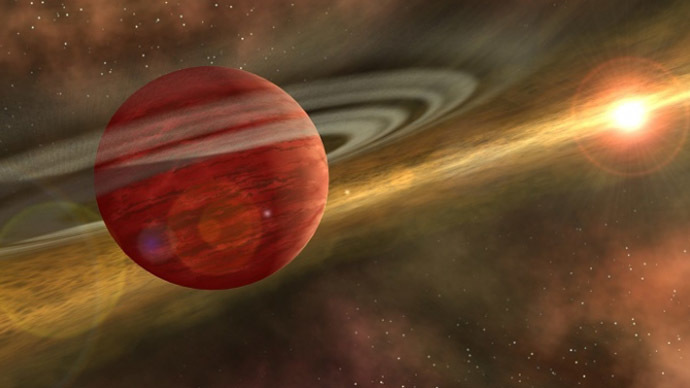 The planet has been described as unlike anything astronomers have ever seen before. “This system is especially fascinating because no model of either planet or star formation fully explains what we see,” said Vanessa Bailey, the team’s lead researcher with the University of Arizona’s astronomy department in a news release.